If it had-n't been for Cot-ton Eye Joe, I'd been a mar-ried long time a-go. Were did you come from, Where did you go, Where did you come from Cot-ton Eye Joe? Cot-ton Eye Joe, Cot-ton Eye Joe, Where did you come from Cot-ton Eye Joe. 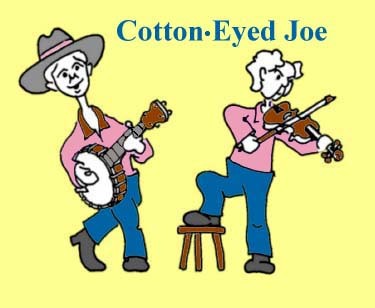 Where-dya' come from, Where-dya' go, Where did you come from Cot-ton Eye Joe.